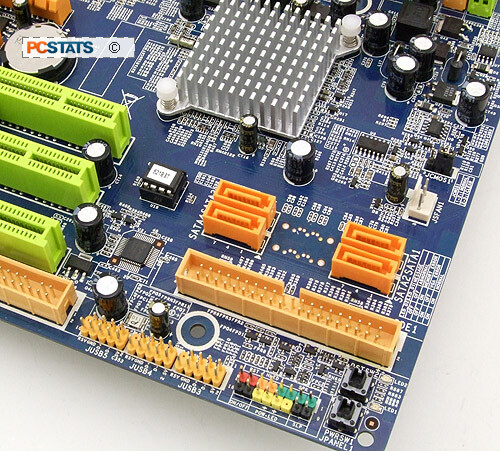 The Biostar TP35D2-A7 has one PCI Express x16 slot, a PCI Express x4 and x1 slot, and three 32 bit PCI slots for legacy hardware. The TP35D2-A7 Deluxe does not support dual videocards. At the bottom of the motherboard are the audio connectors along with the floppy drive connector, not the greatest location, but many consumers aren't even installing floppy drives anymore. 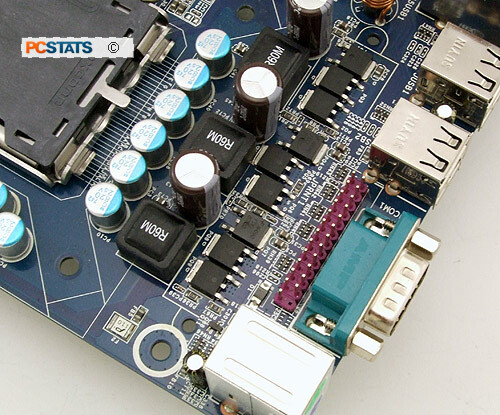 The bottom right hand corner of the Biostar TP35D2-A7 is the busiest part of the motherboard. The Serial ATA II and IDE connectors are located together, just below are the front panel I/O and physical power/reset buttons. We really love these little buttons, when building up the PC before installing it in the case they make the job go a lot smoother. 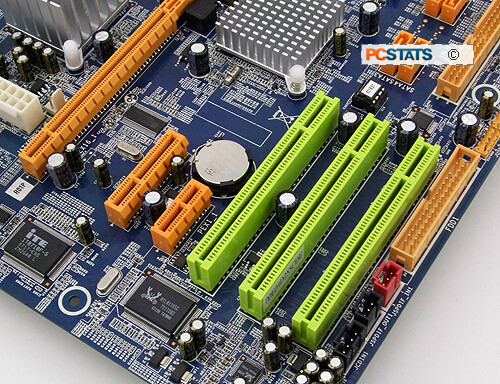 The Biostar TP35D2-A7 is equipped with four DDR2 memory slots. Considering the target audience, it makes sense for Biostar to support DDR2 memory instead of pricey DDR3 memory which offers slight advantage anyway. The memory slots are colour coordinated so you know which slots to occupy with memory to enable dual channel operation. There is plenty of space around the LGA775 Intel CPU socket so you can install larger heatsinks like the Zalman CNPS9700. 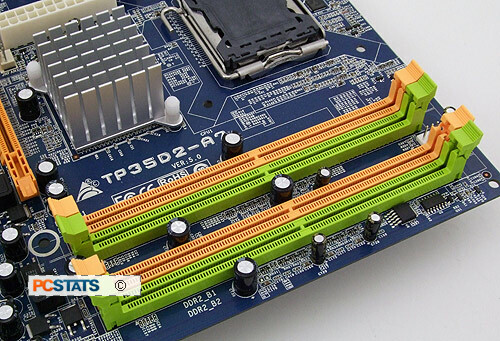 The heatsink on the Intel P35 Express Northbridge is passive, so no noise is created. An actual parallel port has been replaced by a header, if you have a bracket from an older PC, that will work here. If not, check your local computer store for one. 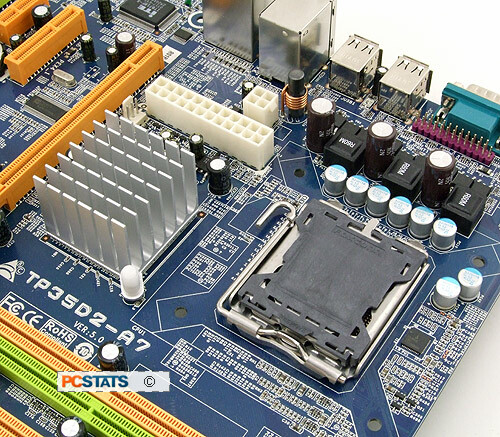 Up next, PCSTATS tries its hand at overclocking the Biostar TP35D2-A7 motherboard... how high will it clock to? Any guesses?